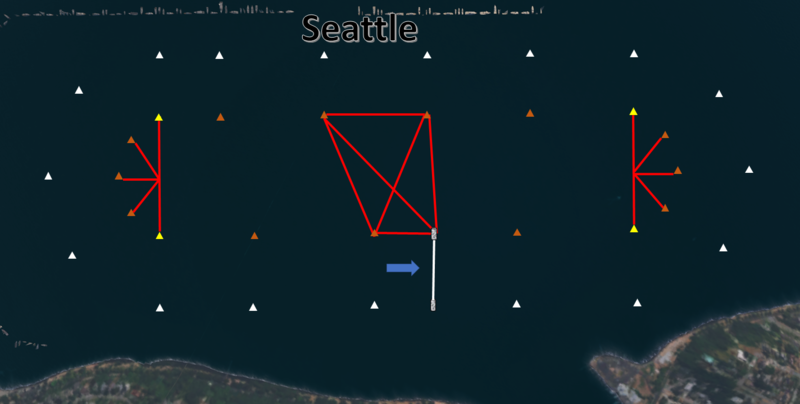 Below is the DMZ Map for the Seattle race course. Race #4 of SNHL Season 1, the Albert Lee Cup at Seafair, is right around the corner! This race is close to home for many of our competitors, so close battles for the win are surely to be expected. The Seattle race course is also the shortest on the circuit at only 2 miles long. You're not going to want to miss this race, because, as they say on the Seafair broadcast, the hydroplanes at Seafair never disappoint! We will not have a Driver's Meeting prior to this race. A DMZ map will be made available on this web page prior to Qualifying. Qualifying order will be in the reverse of the national high point standings (e.g., the High Point Leader will qualify last). The Albert Lee Cup will run 3 flights of heats, followed by the Consolation Heat and the Final Heat. Preliminary Heats and the Consolation Heat will have a maximum of 6 boats per heat. The Final Heat will have 7 boats (the 7th boat being the trailer). The winner of the Consolation Heat will be the trailer in the Final Heat. Race #3 of SNHL Season 1, the Columbia Cup, is less than two weeks away! This race, coupled with the Albert Lee Cup at Seafair, is considered the "home" course by many of our drivers. This race ought to be a good one, so don't miss it! We may or may not have a Driver's Meeting prior to this race. Qualifying format will now follow H1 rules: Qualifying order will be in the reverse of the national high point standings (e.g., the High Point Leader will qualify last). The Columbia Cup will run 4 flights of heats instead of 3, followed by the Consolation Heat and the Final Heat. •	Wait until your name is called in the game’s chat box before going onto course. •	Second consolation will be added if more than 20 boats participate in race. 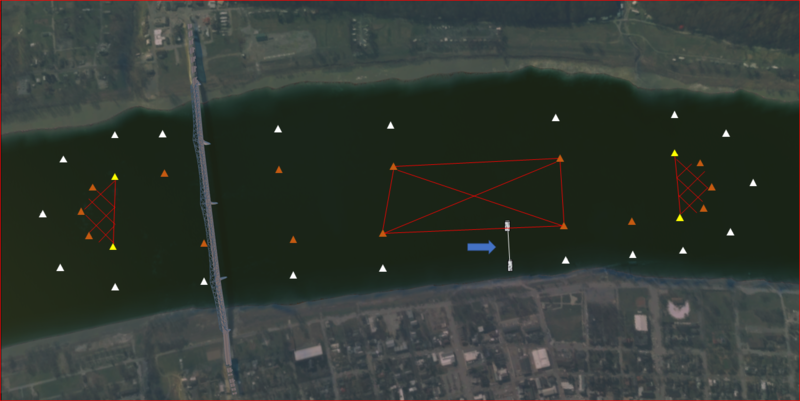 •	You must pass two buoys to establish your lane after cutting. •	Greater enforcement is needed in calling penalties. •	Penalty should only be called when a boat’s roostertail crosses in front of another boat. •	This penalty will be reviewed post-race. •	You must hold your lane from the entrance pin of Turn 2 to the Starting Line. •	If you are boxed in leading up to the start, you have to back off and choose an available lane. •	Trailer must start at the orange buoy prior to the starting line. •	Trailer boat jumping penalty will be monitored as such: If the trailer boat crosses said buoy before the clock strikes 0, then the trailer jumped the gun. •	More participation is needed in officiating. o	If you are officiating 80 mph rule, you must put your boat on the water and park it. •	Monitoring first turn after heat has started. •	Monitor people that crash and keep going. Boats that crash must exit the water and receive a DNF. Majority rules during disputes. •	Keep an eye on boats overlapping. The rule is a roostertail’s length before overlap can happen. •	Due to the tight turns, the minimum speed in the turns will be 60 mph. The rest of the course applies to the 80 mph rule. •	OFFICIALS: Monitor speed at the exit pin of the turns. The driver has two seconds to get back to 80 mph. The SNHL Indiana Governor's Cup will take place in Madison is 1 week away! For those of you who do not have the Madison course, please download the newest version of the game. Meeting began at 6:00 pm Pacific time. •	Qualifying will be held on Friday, October 5th, and will begin at 6:00 pm Pacific time. Qualifying will end at 7:00 pm Pacific time. •	Qualifying will be held in the “Practice” mode within HydroSim. This is to monitor your qualifying laps and call penalties when necessary. •	Only one driver is allowed on the course at a time during qualifying. •	Qualifying order will be sorted alphabetically by driver’s first name. If you are late to qualifying, but join the game before 7:00 pm Pacific time, you will be called upon to complete your qualifying laps when the race director tells you to do so. Do not enter the race course during qualifying without a race director granting you permission. •	Drivers will complete four (4) qualifying laps. Your best lap speed will be used to determine your qualifying speed. o	Each driver after 6th place will receive 30 points. •	Your best lap speed must be above 130 mph in order to receive points. •	Drivers MUST enter the course on the backstretch prior to beginning their first qualifying lap. •	If a driver commits a penalty on a qualifying lap, that lap will not be counted toward their best qualifying speed. o	Failing to enter the course on the backstretch. o	Completing more than four (4) laps. •	Qualifying is for the purpose of earning points and deciding tie-breakers for placement in the final heat and consolation heat. If a driver is unable to attend qualifying, they will still be able to participate in the race with no restrictions. •	As soon as a driver completes their fourth (4th) lap of qualifying, they are to hit the ESC button on their keyboard and leave the water. •	If a driver flips during their qualifying attempt, they are allowed to continue their qualifying attempt. •	The race will be held on Saturday, October 6th, and will begin at 6:00 pm Pacific time. •	There will be three (3) flights of heats, followed by one (1) consolation heat, followed by the final heat. •	In the event of a tie between drivers when placing into the consolation and final heats, qualifying speed will be used to settle the tie. •	All heats will be three (3) laps in length, including the final heat. •	Heat draws will be announced via the text chat box within the game. •	The maximum amount of boats per preliminary heat and the consolation heat will be six (6). The amount of boats that will run in the final will be seven (7). The 7th boat in the final will be the winner of the consolation heat, and must start the final heat in the trailer position. •	After the race director announces a heat – “Heat 1A ready”, all drivers who are to run in said heat will reply by typing “Y”. This signifies the driver is ready to begin the heat. When all drivers signify they are ready, the 5-minute mill time will begin. •	Drivers must have their boat on the water and have their speed above 80 mph prior to the four-minute mark of the milling period. •	Drivers must enter the race course on the backstretch. Failure to do so will result in a 1 lap penalty. •	Drivers must proceed around Turn 2 immediately prior to the start of the racing period of a heat. •	If a driver flips their boat during a heat, including the milling period, the driver is not allowed to continue, and must exit the race course. Failure to do so will result in a disqualification for that heat only. o	Crossing the start/finish line prior to zero (0) seconds on the clock immediately prior to the start of the racing period of a heat (aka Jumping the gun). o	Cutting inside a buoy during the racing period of a heat. o	Cutting outside an outer-course marker. o	Failure to stay outside of the DMZ zones. o	Failure to leave the water immediately after crashing. o	Committing two (2) lane violations in the same heat. •	Deliberately causing another driver to crash will not be tolerated, and will result in the offending driver being disqualified from the entire event. o	Other offenses in which drivers could be disqualified for the entire event will be at the race director’s discretion with the other drivers’ input. •	If a driver crashes as a result of another driver’s actions, the offended driver shall receive a minimum of 4th place points (169). o	The amount of points awarded will be adjusted if driver participation is low. o	If two drivers tie for 1st place, both drivers will receive 400 points. o	The next driver will receive 3rd place points (225), and so on. •	The amount of time for reviewing penalties will be limited to ten (10) minutes. 	The winner of the consolation heat will be awarded the trailer position in the final heat, therefore forfeiting points earned to the driver’s result in the final heat. •	DMZ zones will be in effect. Drivers must stay outside of these zones at all times. •	The map below displays where the DMZ zones are located. •	Prior to beginning a heat, the drivers participating in said heat must enter the voice-chat channel titled “On the Water”. •	Drivers may request a spotter if they wish. •	Should a driver request a spotter, that spotter must also enter the channel titled “On the Water” prior to beginning a heat. The meeting adjourned at 7:25 pm Pacific time.